When you think you have enough of winter, Mother Nature will surprise us New Englanders with a warm, balmy day in the middle of winter. This Sat and Sun were in the 50's, sunny, and a most welcome break. All the sun and balminess just lifts my spirits and remind me that spring is around the corner. My friend Marissa, ( www.brokenbranches.com) has this amazing rubber stamp collection that is out of this world. 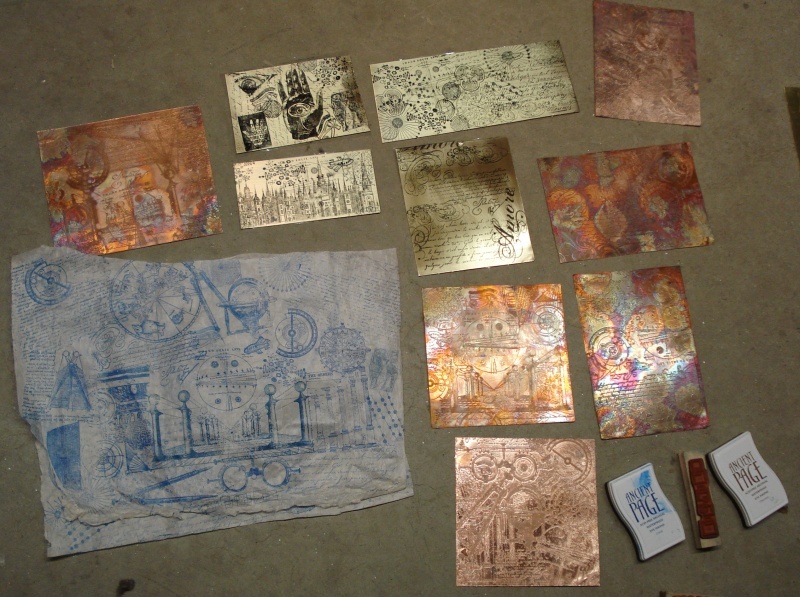 She wanted me to teach her etching, so about a month ago, I went down to her house, and we merrily stamped our way thru multiple pieces of copper sheet. I had 6 fabulous copper panels that looked like very old scientific illustrations. There are thousands of great rubber stamps and I was using scripts, writing, astrological themes, astronomy, eyes, nature themes and more. I'm fascinated with scientific themes, antique scientific intruments, astronomy, some astrological themes, astrolabes, orreries, hydrometers, glass, the universe, the moon, and how things work. I also love old illustrations and prints, and it's fascinating to look at 1700's and 1800's prints of machines, orreries, flora and fauna, the universe, the 1920's and 30's, 50's images and more. I collect old prints and use them as themes. Also along the lines of old stuff. I love old electronics. Radio tubes, old tv, old radios, fans, etc, you name them, I love them. I retro-fitted an 1950's TV cabinet to hold my circa 1992 TV which still works perfectly and a 1939 radio cabinet became a shelf case which doubles as a nightstand. I keep all the old electronics and try to incorporate them into my artwork. Currently a huge glass cathrode TV tube is awaiting to be made into a garden sculpture. I use 60 year old metal fans in the summer and they are better than today's plastic crap that are supposed to be fans, but don't blow air at all. Anyway, to get back on track, I went back to Marissa's this weekend and did some more stamping. I used paper to create my own "scientific illustrations" and some more brass/copper plates to be etched later. Here's a picture of what I've been doing. I am loving the possiblities of stamping images onto metal. To etch metal, you need to use an acid-resistant medium such as nail polish, lacquer, permanent ink, rubber sheet, plastic tape, to name a few. Clean a piece of copper, brass, bronze or nickel sheet very well, so that there are no fingerprints, oil, dirt or anything on the sheet metal. Tape up the back of the sheet metal, then apply the acid-resistant medium, which I use dark nail polish or permanent ink, so that the bare metal that is exposed will be etch. Put sheet metal face down in a plastic or glass container, add enough ferris chloride to cover metal, and check periodically. I find 1 to 2 hours is enough to get a good etch. In using the rubber stamps, I choose the pattern, apply Starz-O permanent ink on the rubber stamp and them press stamp firmly onto the metal surface. That will leave a clear, dark image in bold relief. As you can see in the image, the brass sheets have the black ink stamped on and not etched yet. I'll etch the brass sheets at a later time. I now want to start collect specific rubber stamps so I can continue on with my explorations since I really love how the images come out on paper and sheet metal. I normally don't etch on a regular basis, but I may just do so this year. Thanks Marissa for turning me onto a new hobby!